Need a little math activity? 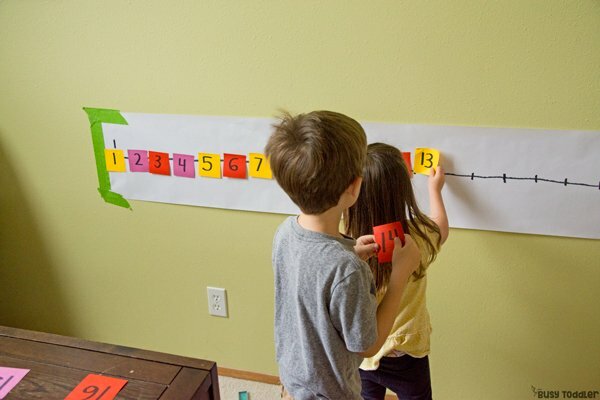 Try this Post-it Number Line game – it’s riot! What is it about kids and Post-it Notes? Moths to little sticky paper flames is what my kids are. I practically have to keep Post-its under lock and key. So I knew when I brought out this Post-it Number Line activity – it wasn’t going to be a tough sell. 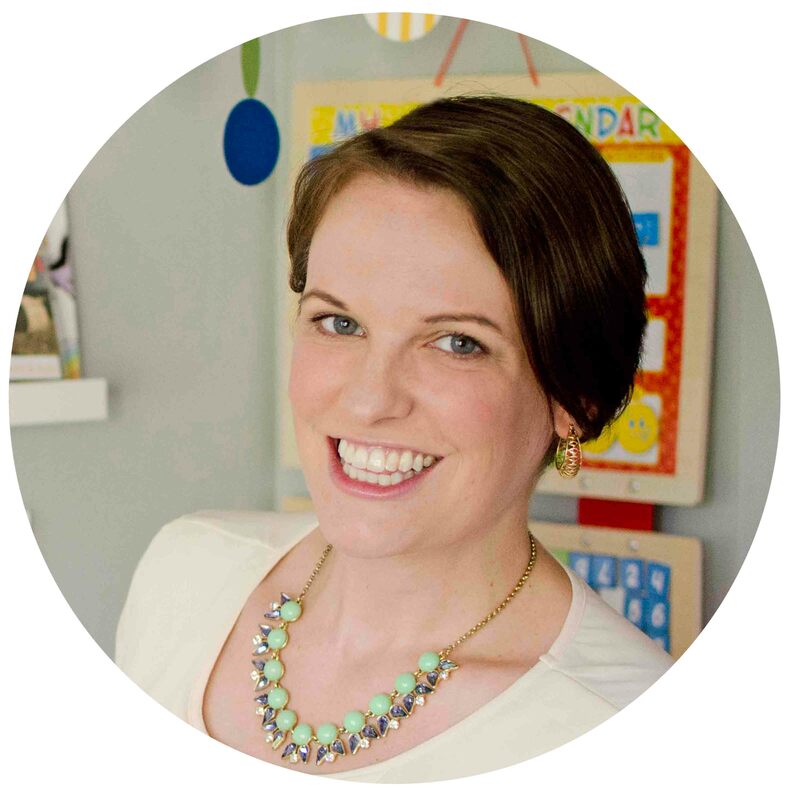 Curious how I teach my kids each day? 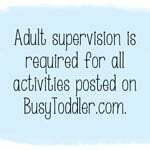 Check out my Playing Preschool Program: 190 days of at-home learning. I love a good “why”. I have to know the reason. I have to know the ins and outs to make something worth my time. 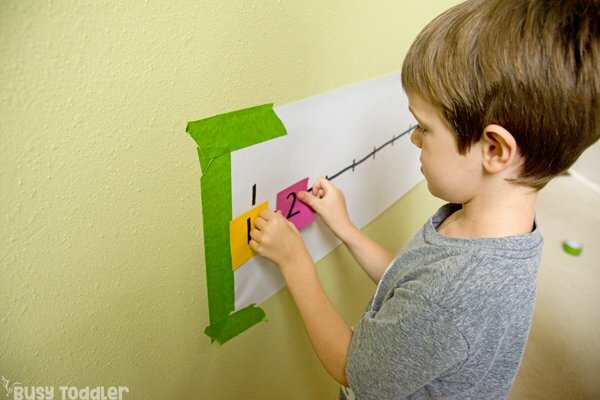 Here’s the why for this Post-it Number Line game. 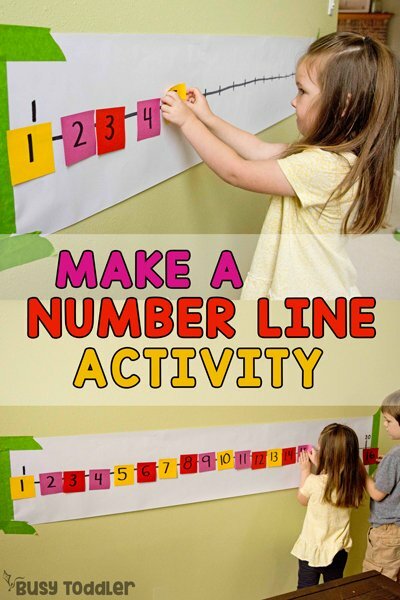 Number lines are a big deal – especially with little learners joining the math game. Number lines are (in a sense) the address to where a number lives. It helps children to visualize the relationship of one number to another (6 is between 5 and 7; 4 is two more than 2). 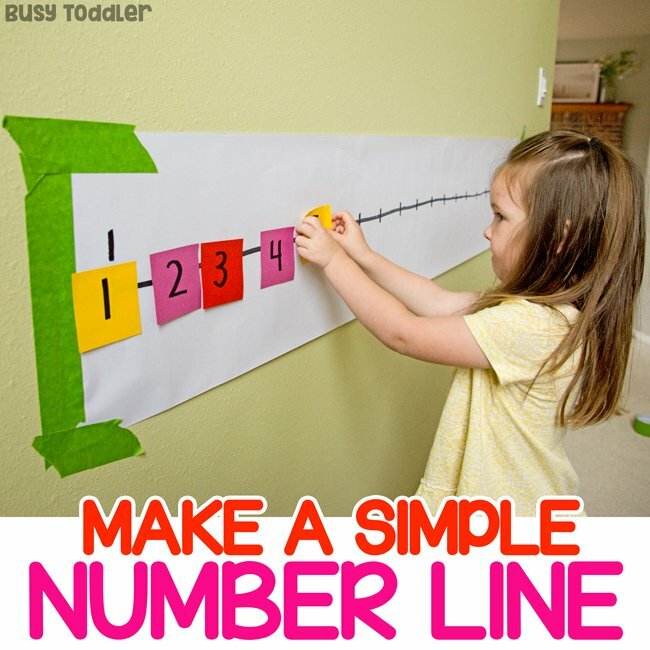 As children develop in mathematical thinking, using a number line will be a critical part. Number lines help give a visual representation to the abstract nature of addition and subtraction. And it’s easy to start introducing a number line now! 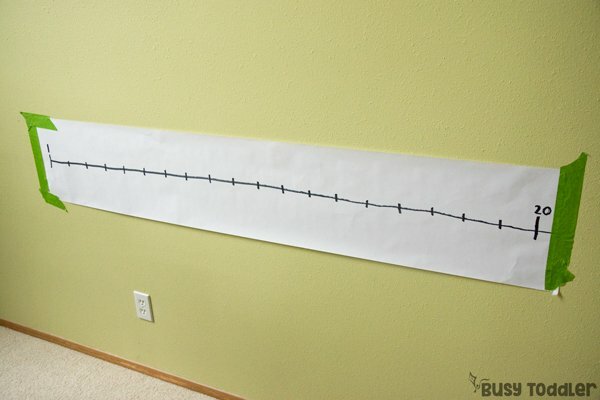 I started by rolling out the butcher paper along my wall and adding a big, giant line down the middle. I measured the Post-it notes quickly to make sure my line could fit 20 numbers on it. Next, I took the Post-its and wrote numbers 1 – 20 on them, and mixed them up. 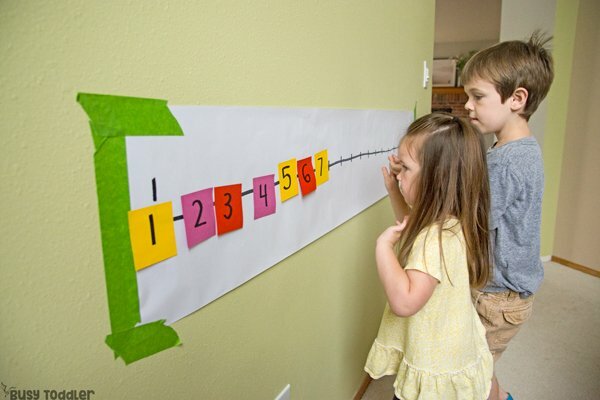 The end goal is for the kids to build their number line out of the mixed up Post-it Notes – to put the numbers back in order. What’s fascinating is watching how children work on this activity – my son (5) was able to remember the number he was on and then move seamlessly to the next number. My daughter (3) needed to recount the numbers each time in order to figure out what came next. It was exciting for both of them! One easy way to get kids moving is to put the Post-it notes around the room. Hide them in, out, and under everything for little hands to find and put in the right spot. Get their minds active and their body’s active too! It’s a fun way to play with math! 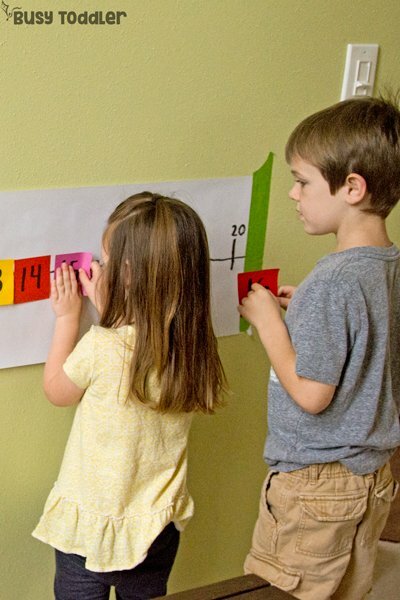 Math doesn’t have to be rote counting or memorizing numbers from flash cards. Math can be interactive and fun! 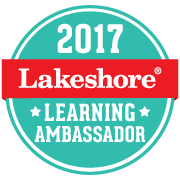 It’s amazing how much kids can learn from a hands-on activity, where they can really touch the learning. 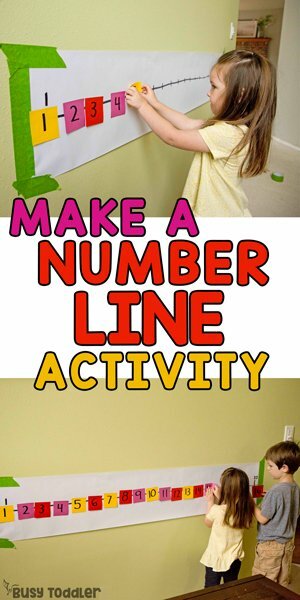 Making this simple number line activity was the perfect way to help my kids visualize the location / address of each number. They’re having fun with this now and years down the road, having background knowledge with the a number line will help them so much. 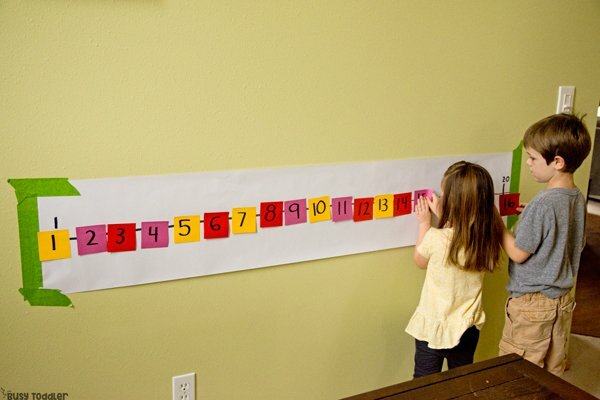 When will you make this Post-it number line activity?